Grand Chancellor Abnur Tharn was the Imperial overlord of Nibenay, and the head of the Elder Council during the middle Second Era. Much like his ancestors, who were known for holding positions of power throughout Cyrodiil since the days of the Akaviri Potentate, Abnur served as advisor to various emperors and kings for over 117 years. During the turbulent rise and fall of Cyrodiilic rulers during the Interregnum, Abnur was the sole constant, providing continuity and consistency. Fiercely loyal to the Empire, Abnur became Chancellor of Elder Council in 2E 465 and has served as the Imperial Battlemage ever since. Ada'Soom Dir-Kamal, also spelled Ada'Soon Dir-Kamal, was the King of Kamal, a nation of Akavir. In 2E 572, he led an army of his people in an invasion of Tamriel, reportedly in search of a person or object roughly translated as the "Ordained Receptacle". Dir-Kamal's army landed in Skyrim near the city of Windhelm, which they subsequently besieged and sacked. Wulfharth, the Underking, was summoned to help repel the invasion of the "Akaviri demon" (sources differ on who summoned him). Dir-Kamal decided to bypass Riften and retreat from Skyrim, instead setting his sights on Mournhold. The Nords refused to let him get away and pursued him into Morrowind, where his army was crushed between them, a Dunmer army led by Almalexia, and a third force of Argonian Shellbacks. Remnants of Dir-Kamal's army survived this battle and resurfaced years later in Cyrodiil, where they seized the Imperial Throne from the successors of the Emperor Attrebus. Bosmer king of Valenwood in the time surrounding the Alliance War, in the sixth century of the Second Era. A member of the long-standing Camoran Dynasty, his power was threatened by both internal political divisions and external military incursions from Cyrodiil. He turned to the newly formed Aldmeri Dominion for aid, and was awarded a high position on Queen Ayrenn's Inner Council. Aetherion is an experimental Celestial created by the Nedes of Skyreach while they were researching the power of nirncrux. It took the form of an ethereal Daedric Titan, a Daedric perversion of the dragon that was created by Molag Bal. Aetherion was close to immortal, and would simply condense back into a core of Aetherial energy when its corporeal form was destroyed. It was imprisoned within Skyreach Pinnacle in Hammerfell along with the lesser Celestials some time after 1E 808, when Yokudan invaders sealed the Nedic wards. In 2E 582, the Scaled Court unsealed the ruins in their attempt to understand the Nedes' usage of nirncrux. This freed the dangerous Celestials within, forcing the cultists to retreat. The expedition leader, Mederic Vyger, subsequently left the Court and attempted to set things right. He enlisted the aid of the Soulless One and re-entered the ruins to fight back against the Celestials and restore the wards. Aetherion appeared at the very end of the ritual in an attempt to stop Vyger, but the intruders destroyed his core and the wards were successfully restored. The significance of the Aetherion Core's destruction is unknown. As such, it is unknown if the Celestial is alive or dead. Brother of the First Emperor of Tamriel, Tiber Septim, and the father of Empress Kintyra. A prince of the Altmer Direnni Clan. Often spoken of alongside his cousins Ryain Direnni and Raven Direnni, Aiden won many battles against the Alessian Empire in 1E 480. His crowning achievement was leading Direnni forces to victory against the Alessians in the Battle of Glenumbra Moors in 1E 482, ending their ambitions of conquering High Rock. Over three thousand years later, around 2E 582, a prince Aiden Direnni contacted the Aldmeri Dominion and asked them to take action against the Bloodthorn Cult in Glenumbra—however its unknown this was indeed the same Aiden Direnni of legend, given the vast difference in time. Around this time his broken sword was also recovered by the Merethic Society to be displayed in their museum in Greenshade. Akorithi (sometimes Akorith-i) was Queen of the Kingdom of Sentinel and wife of King Camaron, and became the Queen Regent upon her husband's death at the Battle of Cryngaine Field in 3E 403. Akorithi and Camaron were the parents of Arthago, Aubk-i, Greklith, and Lhotun. As the ruler of Sentinel, Akorithi played a major role in the events that culminated in the Warp in the West in 3E 417. She and Greklith both died of a plague sometime near the end of the Third Era, and the queen was succeeded by her youngest son, Lhotun. Alandro Sul was the shield-companion of Nerevar during the War of the First Council. It is said he is the immortal son of Azura. According to an ancient Nordic account of the Battle of Red Mountain, he wore the Wraith Mail during the battle, and fought the Ash King Wulfharth. He defeated Wulfharth, but was struck blind during the fight. After the battle, he lived with the Ashlanders, and is credited with spreading the belief among them that the Tribunal murdered Nerevar. 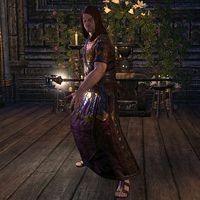 Alessia, also known as Queen Alessia or Saint Alessia, led the First Era rebellion against the Ayleids, freeing the humans of Cyrodiil from slavery and founding what became the First Cyrodilic Empire. As its first Empress, she established a new religion, a fusion of the Nordic and Aldmeri pantheons known as the Eight Divines. On her deathbed in 1E 266, she was sainted by Shezarr (in some stories Akatosh), and her soul placed in the central stone of the Amulet of Kings, thus forging Akatosh's Covenant with men to protect Tamriel from the forces of Oblivion. Belharza the Man-Bull, Alessia's alleged son with the demiprince Morihaus, succeeded her as the second Emperor of Cyrodiil. Alessia is not her birth name, but rather a corruption of a title, Al-Esh ("High Highness"), that was given to her by her followers. Another title bestowed on her was Paravant ("The First"). From corruptions of these two titles come countless other names by which she is known to various peoples, including Perrif, Paravania, and Aleshut. The Alessian Order is so-called because she purportedly appeared to the prophet Marukh in a vision and bestowed her teachings upon him. For more information, see the full article on Alessia. Countess Alessia Caro was the wife of Count Marius Caro of Leyawiin. They were wed around 3E 432. She was originally Alessia Valga, the daughter of Countess Arriana Valga of Chorrol, and the two visited each other regularly. She and her husband were from prominent Cyrodiilic families, and it was widely speculated they were on their way to the Elder Council. Rumor had it that she was the real power behind the throne, not her husband. A member of the Motierre family, a very old and powerful Breton family firmly established in Cyrodiil. They were apparently powerful enough to find the ambitious Amaund a seat on the Elder Council. Around 4E 201, Amaund yearned to take the Ruby Throne for himself, and was looking for a way to have Emperor Titus Mede II assassinated so that he might have it. A renowned knight who first made a name for himself in the War of the Isle, Sir Amiel Lannus was a hero of Cyrodiil, maybe all of Tamriel. He formed the Knights of the Nine in 3E 111, with the aim of recovering the Crusader's Relics of Pelinal Whitestrake. The order attracted the most prestigious knights in Tamriel and performed many great deeds, even recovering four of eight relics. However, the political machinations of the War of the Red Diamond tore the order apart. Sir Amiel spent many of his final years living in solitude in the order's former priory. In 3E 153, he made a final quest to recover an ancient relic he had been seeking for decades, but unfortunately did not survive the attempt. Lord-Admiral Richton became the Provisional Governor of Stros M'Kai after defeating Prince A'tor at the Battle of Hunding Bay. He governed with a heavy hand, freely killing dissenting Crowns and stamping out piracy in the region. Died in the year 2E 864 at the hands of the rebel Redguard Cyrus. "Bold Admiral Richton", is mentioned as a popular drinking song in The Balladeer's Fakebook. Anaxes is a Xivilai who serves as an agent of the Dremora Kathutet. He bears some relation to another Xivilai named Medrike. Like Kathutet, Anaxes once served Molag Bal as a torturer and guard. In 2E 582, he and Medrike were sent to Tamriel by Bal to defend a Dark Anchor. However, they were swiftly banished by the Fighters Guild and the Anchor was released. Some time after this, Anaxes, Medrike and Kathutet came into the service of Mehrunes Dagon. Circa 3E 433, Kathutet was ordered by Dagon to serve Mankar Camoran in Gaiar Alata. He was charged with keeping order in the Savage Garden, where the souls of "unmortal" Mythic Dawn members took part in ceaseless combat to prove themselves. Anaxes was appointed Lord of the Savage Garden, and became feared by the cultists as the worst of their tormentors. The cultists eventually succeeded in trapping him in a cave. Although Kathutet regarded the humiliation of his imprisonment as a fitting punishment, Anaxes' shame made mockery of Kathutet's authority. Seeing the matter as too insignificant for his own attention, Kathutet attempted to bring the Hero of Kvatch into his service in order to free the Xivilai. The outcome of this proposition is unknown, and Gaiar Alata was destroyed shortly afterward. An Altmer agent of the Thalmor assigned as "advisor" to the Arch-Mage of the College of Winterhold. The other members of the College deeply and somewhat openly distrusted him due to his Thalmor allegiance. He vehemently denied that he was a spy, claiming only that the Thalmor wished to promote relations with the College (even though he belittled their work and importance frequently). He was deeply distrustful of the Psijic Order, which he viewed as a rogue organization and enemy of the Thalmor. When the Eye of Magnus was brought to the College from Saarthal, he turned on them, killing several mages, including Arch-Mage Savos Aren. He sought to gain control over the Eye, and nearly created a devastating catastrophe which would have had enormous ramifications on Winterhold and possibly all of Tamriel. However, he was thwarted and killed before he could do anything truly disastrous, and the Eye was subsequently secured by the Psijic Order. Emperor Uriel IV's son, Andorak was disinherited after his father's death by vote of the Elder Council, and a cousin more closely related to the original Septim line was proclaimed Cephorus II by the next year, 3E 248. For the first nine years of Cephorus II's reign, those loyal to Andorak battled the Imperial forces. In an act that the sage Eraintine called "Tiber Septim's heart beating no more", the Council granted Andorak the High Rock kingdom of Shornhelm to end the war. Andorak's descendants still rule Shornhelm as of the Fourth Era. Crowned the Emperor of Tamriel in 3E 99 after the death of his father, Pelagius II. Antiochus was certainly one of the most flamboyant of the usually austere Septim family. He had many mistresses and nearly as many wives, and was renowned for his grandness of dress and his good humor. The province of Summerset was nearly lost to the Maormer under the leadership of Antiochus, 11 years (3E 110) after he took the throne. An alliance between Antiochus and the Kings of Summerset only managed to defeat King Orgnum of the island-kingdom of Pyandonea due to a freak storm. Legend credits the Psijic Order of the Isle of Artaeum with the magic behind the storm. Unfortunately, his reign was rife with civil wars, surpassing even that of his grandfather Uriel II. Emperor Antiochus died after 13 years of rule and his daughter, Kintyra II, took the throne. He was considered a good ruler despite his drinking and "moral laxity". His character plays a substantial role in the popular historical fiction The Wolf Queen. The Ayleid arch-mage and king of Abagarlas, a city of Molag Bal worshippers in a deadly feud with the Meridia-worshipping people of Delodiil. During the course of the cities' war, Anumaril began preparations for a necromantic ritual, the Mortuum Vivicus, which would drain all life from Delodiil. This prompted a daring raid by the Meridians, who were able to infiltrate Abagarlas, kill Anumaril's entire family, and destroy the city entirely. At some point, Anumaril created the Staff of Towers, a powerful artifact whose eight segments corresponded to one of the metaphysical Towers that shape the fabric of Nirn. At the time of the Alessian Slave Rebellion, he fled to Valenwood. Hailed as one of the greatest architects of the First Era, he was responsible for several constructions in the province, such as the Great Seal of Belarata and the archives in the Reliquary of the Stars. One of his more notable creations was the Orrery at Elden Root. On his travels to the great tree, he found the Stone of the Green-Sap Tower, the Perchance Acorn, and tried to recreate the Tower of White-Gold. His attempt failed, due to a fundamental incompatibility between Ayleid and Bosmer magic and belief. The patron saint of Tanners and Miners. A condemned criminal, Aralor repented his sins and made a circuit of the great pilgrimages on his knees. He serves as an example that it is possible for anyone to truly repent and start anew. His famed hair shirt is an artifact coveted by the Tribunal Temple. Aranias was an Altmer girl from the mid-Second Era who was born with the power to control the earth. She became the Wilderqueen of Greenshade in 2E 582. Aranias grew up on the island of Silatar, and used powerful magic to create a fantastical and beautiful paradise on the island. However, Silatar's beauty felt wrong and unnatural to behold, and Aranias' parents were disapproving of her magic. Aranias went on to be known as the Rock Witch of Silatar, and after she accidentally destroyed a passing ship with her powers, her parents departed the island circa 2E 582 to seek a trainer. While her parents were away, Bosmer bandits attacked Silatar and burned the farms, and Aranias was forced to drive them off alone. Her parents returned with High Kinlady Estre and the Veiled Heritance, who promised to help. However, Estre sought only to use Aranias as a weapon, and forced her to rip an innocent Bosmer to pieces as a demonstration of her loyalty. She then departed the island to join the Heritance. For a time, Aranias aided the Heritance on Auridon. She was responsible for the group's infiltration of the College of Aldmeri Propriety, and established their base at the ruins of Quendeluun. After Estre failed to usurp Queen Ayrenn and was killed later that year, the Veiled Heritance sent Aranias to Greenshade with her "trainer", an Altmer named Andur. The Heritance hoped to use her power to kill the Wilderking, a god-king with similar powers who ruled over parts of Greenshade. The Vinedusk Rangers attempted to hunt her down on Auridon along with several other Heritance members, only to discover that she had already departed for the mainland. Seeking to gain the Wilderking's allegiance, the Aldmeri Dominion sent the Soulless One to prevent the Heritance's assassination attempt. A Bosmer Spinner named Maruin told the tale of Silatar's creation, but in doing so he altered the story—and therefore Aranias' memory, so that she would recognize the Soulless One as a childhood friend who lived with her on the island. 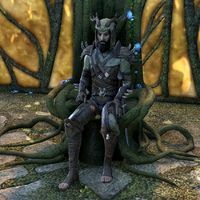 In Mariun's telling, Aranias did not face the bandits alone and refused to kill the Bosmer woman, instead killing Andur and trapping the Heritance representatives. Although these events never transpired, the Spinner's magic showed Aranias that the Heritance was her true enemy, and she was able to fulfill her destiny by becoming the next Wilderqueen. After this mantling, Aranias' identity and memories were consumed by the Wilderqueen. Her final autonomous act was to reveal key details about the Heritance's plot to use the stolen Staff of Magnus. However, the new Wilderqueen remained influenced by the Spinner's tale, and swore allegiance to the Dominion. She saved the vampire hunter Mel Adrys from undeath circa 2E 583 in memory of the Soulless One. 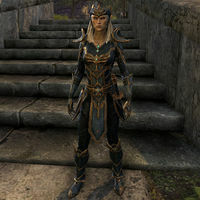 A Thalmor general during the Great War, she led the Aldmeri Dominion's invasion of Hammerfell while her counterpart, Lord Naarifin, kept the Imperial legions occupied in Cyrodiil. Her main force crossed western Cyrodiil, bypassing Anvil and Kvatch, and rendezvoused with smaller Aldmeri forces that landed on Hammerfell's southern coast, quickly overrunning the Redguard defenses. Over the next two years, Arannelya unsuccessfully besieged Hegathe and briefly captured Skaven before being driven back across the Alik'r Desert by an army of Imperial veterans and Redguards. Although the campaign in Cyrodiil ended in 4E 175, the conflict continued in Hammerfell for another five years, during which time Lady Arannelya presumably continued to command the Aldmeri army. Arden-Sul was a powerful prophet and ruler from an old time in the Shivering Isles. The events of his life and death are widely disputed by the people of the Isles, particularly in regards to the Sacellum. As with everything else in the Isles, the division in viewpoints lies between Mania and Dementia. The only thing the ruling powers seem to agree on is that he was a prophet who preached in the building that shares his name, the Sacellum Arden-Sul and had 213 followers. The Manic and Demented versions of his death have even become part of the ritual of accession for each respective duchy. A longer version of his life can be found in the book The Prophet Arden-Sul. Not much is known about Arden-Sul. Some say he was a hero, some say he is some sort of god. The Heretics believe that Arden-Sul is the true lord of the Shivering Isles and that Sheogorath is just a man who needs to be overthrown. The Zealots believe that Sheogorath is a living god and that Arden-Sul is the personification of Sheogorath's mortality. The beliefs of the maniacs and the demented contradict each other almost completely. Queen of Hegathe, in Hammerfell. The daughter of an eminent Crown, Murahd of Rihad, she was one of two wives to High King Ar-Azal. She also served as a general, leading an attempted conquest of Bangkorai with a relentlessness that earned her the sobriquet "Blood Queen". An entry written in her journals in 2E 412 is the earliest known record mentioning the name of the Dark Brotherhood. A Breton researcher and Alteration mage at the College of Winterhold in the Fourth Era. Arniel studied the ruins of Saarthal, and had a particular interest in Dwemer artifacts. He was both passionate about his work and paranoid that it would be stolen or compromised. He endeavored to discover the secret behind one of the greatest mysteries of Tamriel: the disappearance of the Dwemer. In 4E 201, his work came to a head when he finally succeeded in having the dagger Keening brought to the College from Morrowind. He used Kagrenac's tool in an experiment he had devised to try to recreate the event that caused the Dwemer's disappearance. Unfortunately, Arniel's recreation proved to be too accurate, and he has not been seen since. A powerful Greybeard who lived in and around 4E 201. At the time, Arngeir was the only human of the order with the control over his thu'um necessary to speak without fear of wreaking havoc. Therefore, he acted as the Greybeards' representative during this period. He was the right hand of Paarthurnax, the Grandmaster of the order. Arngeir tutored the Dovahkiin in the Way of the Voice and helped bring about the final defeat of Alduin. The "righteous and reliable" Imperial ruler of Chorrol during the Oblivion Crisis. Her beloved husband Charus had been the hereditary Count of Chorrol, but she inherited the throne after his death in battle against Nord clansmen from Skyrim. She was known as a devout follower of Akatosh. Her daughter, Alessia Caro, became Countess of Leyawiin, though the two visited each other regularly. King of Daggerfall in the Fourth Century of the Third Era. Husband of Nulfaga and father of the future King Lysandus. Primate Artorius Ponticus, formerly known as Artorius Ancrus, served as the leader of the Akatosh Chantry in Kvatch during the mid-Second Era. Based in the Great Cathedral of Akatosh, he was a very powerful and influential figure in the years leading up to the Planemeld in 2E 582. A deeply spiritual man, Primate Artorius has spent almost his whole life in service to Akatosh, and was considered the religious authority of Cyrodiil. As Primate, Artorius oversaw all aspects of Akatosh worship in the Cathedral. He was supported equally by Grand Chanter Surus and Grand Sermonizer Fithia, as well as the warrior-priests of the Order of the Hour. Despite his religious station, Artorious was also secretly embroiled in political subterfuge and sought to shape the political landscape of the Gold Coast. With his vast network of spies and informants hidden throughout the Gold Coast, many heralded him as a stabilizing force in the region for most of his reign. In his later years, he was caught in a feud with the Dark Brotherhood and also a three-way power struggle for control of the Gold Coast. A Harbinger of the Companions in the Fourth Era. While in Hammerfell, he found Kodlak Whitemane working as a bodyguard and recruited him. Upon his demise, he named Kodlak his successor. The figurehead Dunmer ruler of Mournhold known as the "Grace of All Gods, King of Morrowind, Duke of Mournhold; Defender of the People and the Law; Loyal Servant of the Emperor and Empire", etc. He was the uncle and successor to Queen Barenziah after the Arnesian War in 3E 396, and he was himself succeeded by his great-nephew Hlaalu Helseth. His chosen heir had been his beloved nephew, Talen Vandas, although he died, apparently in a hunting accident, shortly before Athyn himself. Shortly before his death, he was dealing with complaints about high tariffs on liquor. It's rumored Helseth poisoned him, and was also involved in Talen's death. King Llethan was survived by his wife, Ravani Llethan. Son of the last High King of Hammerfell, Thassad II, who had died in 2E 862. After his death, the Forebear faction took control of Sentinel, the capital of Hammerfell. Prince A'tor rallied his Crown supporters at his principality of Stros M'Kai and launched a bloody attempt to recapture the city by sea. However, he was taken by surprise by Tiber Septim's assistance of the Forebears, and was eventually defeated by their combined forces at the Battle of Hunding Bay, near Stros M'Kai. His soul was later fused with his longsword to create the Soul Sword, which was instrumental in liberating the island of Stros M'Kai from the clutches of Lord-Admiral Richton. Attrebus was an Imperial soldier who served under Tiber Septim. Fiercely loyal to his Emperor, he had little patience with people who refused to acknowledge the obvious benefits of the Empire, and often advocated for harsher treatment of subversive elements. The sixth son of a peasant family from the backwoods of Colovia, he ran away from home at sixteen to join the Third Legion mustering in nearby Anvil. The Third was immediately posted to the Imperial City to help put down the Moth Rebellion. The proudest moment of his life was when the Third marched with Tiber Septim's honor guard during his triumphant reentry into the capital. Attrebus saw action in every corner of the expanding Empire over the next few years. He was wounded during the storming of Tarak Shan, and nearly lost a leg to an Argonian feather-serpent during the grueling pursuit of Reekee's kidnappers into the depths of Black Marsh in 2E 861. In the sack of Senchal (which is not a part of the official history of the Empire), after the Khajiit had refused to surrender to General Pottreid, Attrebus participated in the wholesale slaughter which followed. They showed no distinction between man, woman, and cubling. He would later claim to have killed thirty of the "catmen" himself. He was among the few who escaped the trap at Black Rocks set by the Aldmeri Dominion. He and the other survivors went on to make up the core of the new Ruby Legion, and Attrebus spent an uneventful year on garrison duty in the Nibenay Valley. His company was then posted to Hammerfell as the personal guard of Lord Amiel Richton, the Provisional Governor of Stros M'Kai. By the age of twenty-three, he was already a grizzled veteran. However, he was still no match for Cyrus the Redguard, who defeated Attrebus during the Stros M'Kai Uprising in 2E 864. Described as one of the many pretender kings of the Interregnum, the warlord Attrebus claimed the Imperial Throne sometime between 2E 430 and the reign of the Longhouse Emperors, and mounted a campaign to rid Cyrodiil of foreign influence by expelling the Akaviri. The Akaviri refugees went on to settle in Elsweyr and found the city of Rimmen. Prince Attrebus Mede was the son of Emperor Titus Mede. He was one of several heroes involved in the banishment of Umbriel in 4E 40. Lord Auberon Flyte and his wife Doryanna were the rulers of Anticlere, a region in the Iliac Bay, formerly known as Reich Gradkeep. They were the leaders of Anticlere's knightly order, the Knights of the Flame. They became regents of Reich Gradkeep following the slaughter of the previous ruler, Lord Graddock, and most of his family during the War of Betony. Of the previous ruling family, only one sickly infant survived. Lord and Lady Flyte ruled in regency until the infant's death. Lord Flyte's strong, almost dictatorial style was just what Reich Gradkeep needed to restore order after the bloodbath caused by the Treaty of Reich Gradkeep. After the infant's death, Lord Flyte and his wife were elevated from regents to rulers by their subjects. They also agreed to rename the region in his honor; thus, Reich Gradkeep became Anticlere, named after Lord Flyte's ancestral home. Queen Aubk-i was the wife of King Gothryd of Daggerfall. She was born to King Camaron and Queen Akorithi of Sentinel in 3E 386, and was the younger sister of Prince Arthago, and elder of Princes Greklith and Lhotun. As queen, Aubk-i played a role in events preceding the Warp in the West in 3E 417. The Augur was once a Breton mage and a well-respected, brilliant student of the College of Winterhold. He delved into magic in a way no one had seen before, and showed a particular talent for the School of Restoration. However, during an ambitious magical experiment, he lost his corporeal form, appearing instead as a large sphere of blue-white light. He has resided in the Midden, the catacombs beneath the College, ever since. He possesses a unique wisdom which the College has relied on in times of need. In 4E 201, he guided the College through the potentially disastrous crisis they faced following their excavation of Saarthal and the discovery of the Eye of Magnus. Queen Ayrenn Arana Aldmeri of Alinor was a leader of the Aldmeri Dominion in the Second Era. She was born on the 5th of Second Seed in 2E 555 to her father King Hidellith and her mother Kinlady Tuinden, and all of the Summerset Isle reportedly celebrated for fifty-five days. She was nimble and quick-witted in her youth, and would often disappear for days at a time. In 2E 573, amid many signs and portents, she disappeared, and her brother Naemon was eventually named heir to the throne. There are many myths about how Ayrenn spent the intervening years, but when her father died in 2E 580, she surfaced in Velyn Harbor to the surprise of all and returned to formally claim her birthright, becoming Queen on the 7th of Frostfall (hence her nickname, the "Unforeseen Queen"). Azra Nightwielder was the original Shadowmage, and a pioneer of Shadow Magic. He was the first to discover that shadows were not merely an absence of light, but the reflection of possible worlds created by forces in conflict. Azra attempted to manipulate his own shadow to such an extent that all possible versions of himself would become melded into a singular existence. Redguard soldiers, fearing the power he would command should he succeed, surrounded him in northern Hammerfell. During the fight, Azra lost control of his magic and blasted a large hole in the ground, having apparently perished. A small village grew around this crater; it was named Azra's Crossing in homage to the wizard. Many years later, during the Imperial Simulacrum, an Umbra' Keth (Shadow of Conflict) formed due to the ongoing War of the Bend'r-mahk. In 3E 397, an unknown hero on a quest to destroy the Umbra' Keth discovered a large crystal in the depths of the Fearfrost Caverns. Inside this crystal was Azra Nightwielder, who was suffering from memory loss and couldn't recall his identity. Azra connected his shadow with the hero, who promised to uncover the mage's identity. The second incarnation of Pergan Asuul, a shadowmage who was trying to strengthen the Umbra' Keth by battling with the hero repeatedly, revealed the mage's name with his dying breath, which helped to restore Azra's memory. Azra and the hero met again in the crater in Azra's Crossing. Azra provided vital information pertaining to the Star Teeth, which were needed to defeat the Umbra' Keth. The shadowmage appeared at the final battle between the hero and the Umbra' Keth, and has not been sighted since. Although less well known, Azra was also a pioneer in the field of enchanting staffs, and, although his methods grew to be considered rudimentary by the standards of the Fourth Era, he was still considered a genius in his field. Many of his staves can still be found scattered across Tamriel. Master Neloth of House Telvanni is a collector of Azra's work, and has admitted to have learned a lot from studying his staves. Azra Root, an expensive herb, bears the shadowmage's name. ^ The Merethic Collection quest in ESO. ^ Kodlak Whitemane's dialogue in Skyrim. This page was last modified on 21 October 2018, at 07:14.